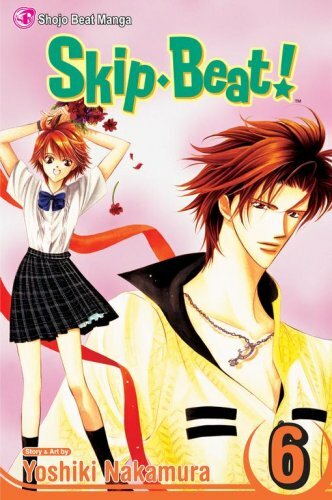 The last two volumes of Skip Beat have had similar formats. Both have six acts. The first act is kind of a story on its own. The remaining five acts comprise the main plot of the volume. I loved the first act of Volume 6. Kyoko and Moko finally transform from enemies to compatriots with a common goal to close friends. They have a relationship built on trust and mutual interests. This is handled through comic relief in the first act. Erika is trying to sabotage Moko so she won't be able to perform the commercial. But each time she or her lackeys try to attack her, Kyoko moves her out of the way in the nick of time. Not on purpose - she just happens to pull Moko in a different direction when she gets excited and wants to show her something. The main part of this volume involves Kyoko's attempt to serve as Ren's manager. Ren and Kyoko are starting to like and trust one another. That's not quite true yet. I suppose it's more accurate to say that the walls between them are starting to crumble. Ren has a grudge against Kyoko, because he thinks she's only trying to become a celebrity to show up Sho. That may have been Kyoko's initial reason, but she's advanced beyond that. She really wants to be a good actress. Both Ren and Kyoko are incredibly hard workers, stubborn, and persistent. When Ren falls ill with a bad cold, he insists on working through it. Kyoko similarly goes to extreme lengths to make sure that Ren's cold is treated quickly and his symptoms are decreased. Ren can't help but notice Kyoko's kindness and indefatigable spirit. Similarly, he's realizing that Kyoko is actually talented. He's starting to respect her both as an actress and a person. Now that Ren and Kyoko are thawing and we're discovering Kyoko's talents, I am super excited to see where the next volumes takes us. I love it when Ren gets the cold because he finally gets to see the kind side of Kyoko. It's all very sweet. Great review! Love this series. Sounds like this was a pretty solid volume! I can't stop staring at the cover though - the guy's neck is just so long. It's the only thing I can see:) The illustration is gorgeous though, I think I would enjoy manga for the artwork alone! I've always wanted to check out some Manga, but I'm never really sure what I want in one. This looks like a cute and fun read though! Great review.